In just 17 short days my sweet boy will be one year old. What a year it has been! The best way that I can imagine celebrating the past year is by honoring the day that I officially met my little man. We planned a home birth with our midwives. If you read about my pregnancy, you know that I was feeling like I didn't have a place to call my own in the few months before giving birth. We ended up renting out a condo-like birthing space owned by my midwives. It was a beautiful, serene, & peaceful spot used solely for births. It didn't have anything more or less than a home would, except a large & beautiful birthing tub installed in the bedroom & a kitchen I'd love to call my own! I ended up with an amazing doula, Heather, who is actually a midwife but wasn't originally on my birth team. She lovingly offered her services as a doula after we bonded though my pregnancy. The plan was to have her labor at home with us until I hit the 5-1-1, (contractions five minutes apart, one minute long, for one hour) when we'd make our way over to the birth suite. We didn't know what we were having until he was born! It was 3:30am on Friday, April 11th in Long Beach, CA when I suddenly awoke. Although I didn't feel an immediate urge to pee, I assumed that that's what had woken me & waddled my way to the bathroom. As I tucked myself back into bed I felt something going on in my belly. Could this be it?! It didn't hurt...but it was new. I couldn't help but stay awake a bit longer to see if more would happen. My midwives had constantly reminded me that it was very important to sleep through the excitement of early labor contractions. I could hear them sweetly suggesting that I rest as I laid with my hands on my belly, a huge smile on my face, & my eyes wide open with wonder. There it was again...that feeling! WHAT WAS IT!? I looked at my watch-ten minutes apart. I was so giddy, but patiently still as to not wake my husband (who I was convinced would tell me to sleep like he had been advised to do by the midwives). I waited up for an hour, feeling "that feeling" about every ten minutes. I had collected my data :] I knew I was on my way to meeting my baby & that was enough for me. It was time to rest. I was able to sleep through the contractions for a few hours & then between contractions for a few more. I would wake with the pain, & sleep with the peace...untiiiiiiilllll HOLY MOLY. It was 8:15am & I was jolted awake by a rumbling in my core. The feeling was...intense...& radiating through the sides & below my belly button. Since I had never been through it before, I had no idea where I fell on the labor spectrum. Were these "mild" early labor contractions? Was I beginning active labor? I had no scale with which to compare. As I was getting ready for breakfast the contractions became more & more persistent with a little more punch. I couldn't even get dressed without having to stop & breathe through the moment. Those darn things wouldn't let up! At this point, all I felt was pain. The contractions were gaining strength & my mind was still completely aware of every flexing uterine fiber. I could feel them wrap around my baby in an effort to push him or her out. It was a striking pain in the lower half of my core. Nothing like I had ever felt before. I had been told that the process starts with pain & ends with intensity. The pain had set in. Although I couldn't seem to slow down my progress (a sign of active labor), I kept worrying that my mind was exaggerating the power of my contractions. 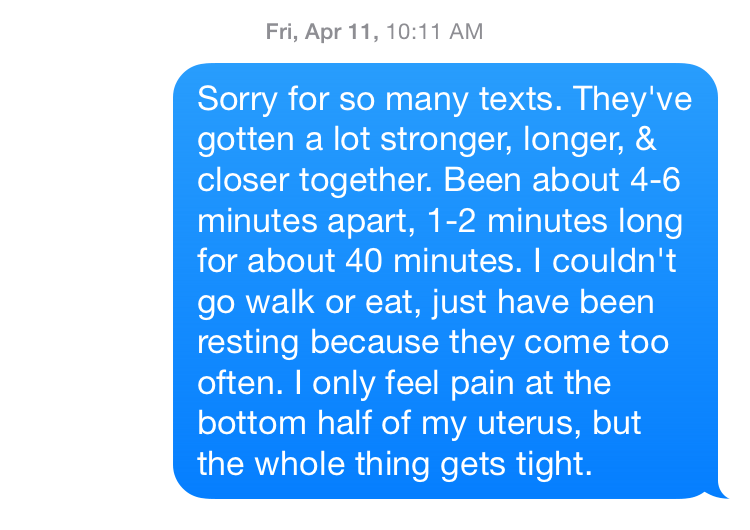 My doula was very calm about it & didn't seem to think I was too far along (via text). She wanted me to nap, after all. I remembering wondering how in the world people slept through that. I sent her one more text, then Oscar gave her a call. He told her that he thought that she should make her way over sometime soon since there was a lot of activity happening at our place. She told him to get me into the bath to relax & rest, & that we should update the midwives on our progress. She suggested that (since she lived right near the birth suite in west LA) maybe we all meet there when I felt ready, going a little earlier than planned. I'm not sure of all the details of that conversation, but it ended with an "I'll call with an update soon" & no doula on her way. I had no interest whatsoever in getting into the water as they kept suggesting. I didn't know if I was overestimating my progress, or she was underestimating it, but we didn't seem to line up. I didn't mind though, I was too focused on the experience to really care. As long as I was where I needed to be when baby was born, I was happy. My mom arrived around 11 o'clock to stock our fridge for our first week with baby. She also came bearing labor snacks & a dozen fresh young coconuts (great for electrolytes during labor). Although I had originally wanted to labor with just the hubby & doula, I felt comfortable at the time & had her stay for a bit. The next hour & a half was a lot of pacing interrupted by "baby rumbles" that brought me to my knees...literally. Something about being grounded on all fours helped me through. I also enjoyed hanging with my arms around Oscars shoulders, swaying left to right, dancing with my baby as he or she was being nudged closer to the world. Each contraction came on with thunder. I would feel the bottom half of my uterus well up with a vibrational pain as the entire organ became a tight egg shape beneath my skin. At this point, the pain was almost undetectable beneath the sheer intensity of it all. I would breathe in & moan out with each breath. The noise was not one of discomfort, but one of release. While Oscar was putting pressure on my back or holding me up during contractions, mom was timing them. They were all over the place. One would last for a minute with a two-minute break, the next would be two minutes long with a 30 second break. All I knew is that they kept coming. Between contractions I was at peace. I was starting to tire, & most of my "rest time" was spent catching my breath. I finally blurted out "Someone call Heather & tell here to get here ASAP". I needed some extra support. Oscar gave her a call & she encouraged him one last time to get me in the bath while she was on her way over (45 minute drive). I finally gave into the idea, even though it was the last place I wanted to be. Being in the water took so much pressure off my body. It felt like a warm hug. I labored in my small tub for 45 minutes, experiencing contractions anywhere from one to four minutes in length, resting for 30 seconds to 5 minutes between. My labor was a fairly quiet one. I grunted with the release of tension as I breathed through the contractions, but there was certainly no screaming...until that four-minute humdinger I mentioned earlier. Those four minutes felt like an eternity. My body was locked up in a pain that was numbing, without actually numbing a thing, if that makes any sense. It was so severe & lasted so long that I yelped out in anger, wishing for it to pass. I had unknowingly been laboring at "5-1-1" for over two hours & a change was coming. I had to get out of the water. It had done its job & was no longer needed. Heather arrived just as I was towelling myself off, around 1pm. I threw on some sweat pants & a t-shirt & continued my thing. Heather jumped in, in place of Oscar. Being the birth professional that she was, her hands felt like magic. She was able to apply pressure & release pain much better than I could have hoped for, which made continuing easier to do. The contractions were coming one after another as I tried to explain my progress to Heather. After 20+ minutes of a constantly interrupted failed attempt at explanation she asked if she could "check to see my progress". I laid on the bed where she proceeded to do a vaginal exam. Heather: "Ok, we should make our way to the suite"
Me: "Well, how far along am I?" Heather: "I mean, you won't have the baby in the car (reassuring ;]), but we need to go. You're 5 centimeters & fully effaced." The look on her face was priceless. She had no idea I had been in active labor for so long. I felt validated & was happy to know that I wasn't overestimating a thing! i was not looking forward to the car ride. My mom went home, Oscar & I took one car & Heather followed in hers. As I buckled in, the belt felt like it was tearing into me. I leaned my chair back as far as it would go, but felt like I was ten times larger than the car itself. I was suddenly, after freely laboring for hours, a caged animal just as my body began making its way into transition (the most intense part of labor before pushing). The contractions were coming back to back with nearly no break in between...& I was pissed. All I wanted was to be out of the car. Oscar: "Are you kidding me? Um...babe. I'm lost." It wasn't what I wanted to hear, but I couldn't help but chuckle. We had driven that route 100+ times, & Oscar never get's lost. He tried to distract me by pointing out a nice view & undiscovered park, but I quickly returned focus to my aching belly. My whole body trembled with tight vibration as I literally kicked & screamed (yes, I did scream a bit at this point) through Friday afternoon LA traffic. WHY BABY? WHY DID YOU COME ON A FRIDAY IN LA?! We finally got to the center around 3:15pm. I have no recollection of the trip from the car to the suite. a transformation had taken place. At this point all guards went down & the primal mama came out. I remember repeating that I had to poop over & over as my midwives & doula escorted me to the bathroom. I immediately stripped & attempted to sit on the toilet. I was sweating & flustered, & couldn't manage to focus on trying to actually poop. I knew what was really going on. I knew that my baby was getting very close to meeting me face to face. One of the midwives asked if I'd like to get into the birthing tub, & although my internal temperature felt like it was rising, the memory of the serene tub at home convinced me to give it a try. The water was no more than lukewarm, but it might as well have been boiling. I was swaying side to side as my doula poured water over the dry parts of my body. I didn't like it at all, but didn't have the energy to tell anyone otherwise. I could feel the color leaving my face & sweat dripping from my brows. They had me stand up so that they could assess the quality of my amniotic fluid as it began to flood the tub. I could only stand assisted. They told me that I could get back in & I shook my head fervently. "Get me out, get me out, I need to get out." I was hot & clammy & felt as if I was on the brink of passing out. The contractions were now a nonstop series of excruciating intensity. It almost felt like lighting was pulsing through my veins with every squeeze of a muscle, & it stayed there, running me down until the next one hit. There was no rest. There was no relief. I made my way to the bed a few feet away from the birthing tub. They asked me to get on all fours & I remember feeling shocked as I watched blood dripping from my body. More blood than I had expected to see. In that moment I could not comprehend what was about to happen. I had spent my entire pregnancy talking about why lying down to push made no sense. I had envisioned a peaceful water birth, or helpful squatting position while pushing. All I wanted to do was lay on my back. No more pain. I could breathe. I could talk. I was aware. I felt like a million bucks. Still no pain, all of the energy that had run through my body with contractions was now focused on pushing my baby out. My midwives had a hard time convincing me to push when I was feeling such joy in the sudden ability to rest. I eventually gave in & pushed with all my might through each contraction. Not only did I feel an immense amount of pressure, but the burning...oh the burning. Midwife Molly: "ok, you're almost crowning"
Me: "Almost?!?! WHY DOES ANYONE DO THIS MORE THAN ONCE?" Midwife Molly: "The head is out! One big push & you've got it." I honestly thought he was joking. The midwives helped me to lift my sweet baby up onto my belly as far as he good go with the cord still attached. I couldn't see his face, but kissed his wet little hair & stared with disbelief at what had just happened. I didn't cry. I thought I would cry. I wanted to cry. I was just too tired. I spent the next few minutes holding my boy & birthing the placenta, which was not as painless as others had led on. I finally got to see him! What a cutie he was. He had this sweet little mark on his lip, brown hair, & blue eyes...&...yup, I double checked, he really was a boy! Baby boy Serna was born on April 11th, 2014 at 5:14pm.